The package comes with IBC Solar 310W monocrystalline panels delivered on pallets and includes all the components you need to install your system. Available with Poly panels as well. 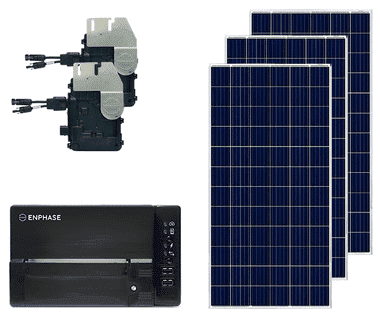 The Grid Tied 5kW DIY solar kit with Enphase IQ+ Microinverters is an all-in-one solar kit at best price. This package was specially designed for customers that have periodic shading issue. This grid tied 5kW DIY solar PV package is your perfect choice to maximise your electricity production. This grid tied DYI solar package comes with Enphase IQ7+ microinverters which is not only easy to install, but also allows for quick AC connections. The 99.8% efficiency microinverters will generate you the AC Power right from the solar panel; therefore you wont need a solar inverter. All you need is just a qualified electrician. The German IBC Solar pv panels will guaranty you a 25 years reliability and also a perfect look of your roof. Optionally can be ordered with LG, Panasonic, JA Solar, REC and Jinko solar modules as well. The Grid Tied 5kW DIY solar kit with Enphase IQ+ Microinverters is a solar system that fits your needs. The solar system can be extended at any time. Smart Energy Storage Compatible – Enphase optional IQ‐AC Battery high-performance energy storage solution brings you more intelligence and better value than anything else, with the industry’s lowest cost of entry and best lifetime value. It pairs seamlessly with Enphase IQ Microinverter to help you make the most of your energy. AC Battery is designed to be used for self-consumption / self supply and will not operate when the grid is down. Our Grid Tied 5kW DIY solar kit with Enphase IQ+ Microinverters is featured with IBC Solar panels which are ranked among the highest efficiency panels in the industry bringing customer value of more energy. 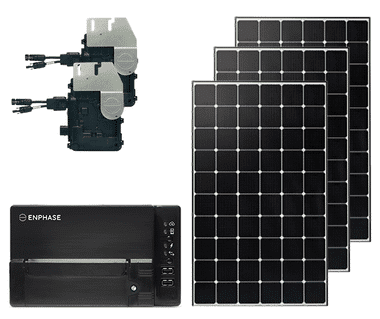 Enphase products come with a 25 Year Warranty and are both CE and UL Listed. Designed for higher powered modules, the smart grid ready Enphase IQ Microinverter is built on the seventh-generation platform and achieves a high efficiency for module-level power electronics and reduced cost per watt. Fully compliant with EU and NEC 2014 and 2017 rapid shutdown requirements. Solar Permit Service (SPS). Solaranna` permit service (SPS) is offered in EU and USA – at an extra cost – as a value added service for our customers only who purchase our grid tied or off-grid solar packages of minimum 18 panels or more. The building permit SPS is available for most pf the countries in the European Union, Australia and in majority of the states in the USA to help you get through your local jurisdiction building permit process. Our team of professional designers can provide the documents, blueprints and expertise needed to work with any building department internationally or nationwide in your country. Enphase Energy is a NASDAQ-listed energy technology company headquartered in Petaluma, California. The company designs and manufactures software-driven home energy solutions that span solar generation, energy storage and web-based monitoring and control. The American manufacturer has shipped about ten million micro solar inverters, known as “microinverters”, sold primarily into the residential and commercial markets in North America, Europe and Australia. Enphase was the first company to successfully commercialise the microinverter on a wide scale, and remains the market leader. Join our ZERO Home Bills Community. BEST Products from the BEST Brands at BEST Prices for ZERO Home Bills on ZEROhomebills.com by Solaranna. You need further products by Enphase Energy. Are here. The package comes on pallet and includes all the components you need to install your system.